Batman and the Outsiders (2017) Average 0.00/5 - out of 0 total votes. For years, the Batman has waged war on crime. Whether patrolling the streets of Gotham City or battling evil worldwide with the Justice League, he will face any foe, no matter the cost. But wars have a way of spreading. And when a deadly conflict abroad hits close to home, the Dark Knight must abandon his old allies and form a new force for justice-a team of heroes who aren’t afraid to operate outside the rules. Katana. Black Lightning. Metamorpho. Geo-Force. Halo. Some are experienced combatants who’ve been driven to the fringes of the metahuman community. Others are new to their powers-and the danger that comes with them. 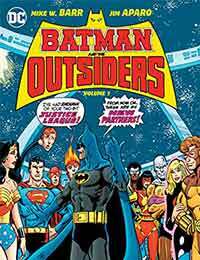 But together, under the shadow of the Bat, they will redefine what it means to be a superhero team… From comics legends Mike W. Barr (BATMAN: SON OF THE DEMON) and Jim Aparo (BATMAN: A DEATH IN THE FAMILY) comes BATMAN AND THE OUTSIDERS VOL. 1. Guest-starring the New Teen Titans, it’s the start of the classic saga that takes the Dark Knight outside all expectations! BATMAN AND THE OUTSIDERS VOL. 1 collects THE BRAVE AND THE BOLD #200, BATMAN AND THE OUTSIDERS #1-13, and NEW TEEN TITANS #37.